We have had this great recipe for banana bread forever. It was actually on the back of a bag of Gold Medal® flour. 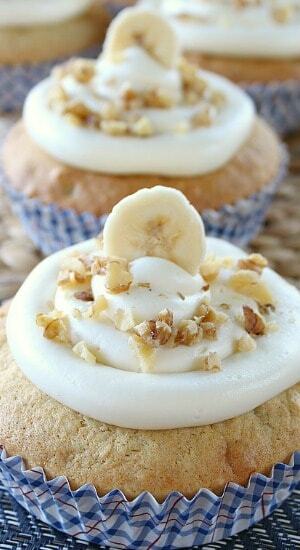 I decided that making some banana nut bread with buttercream frosting would make the banana bread even better. Boy, was I right! 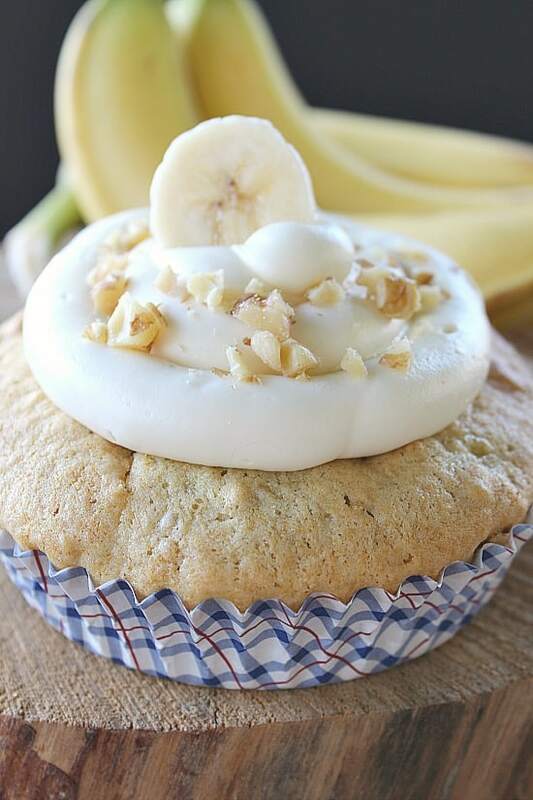 These cute little oven safe baking cups worked out perfectly for making this banana nut bread. They are about 4 inches wide and a little over an inch tall. Perfect when a cupcake is just not enough and a cake is too much, this is the perfect size for a large piece of sweetness. 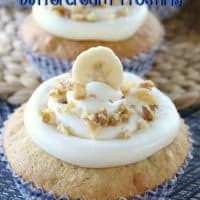 Banana anything is always amazing and these banana nut bread with buttercream frosting cakes are definitely some serious sweets. Imagine sinking your teeth into this deliciousness. SO GOOD! 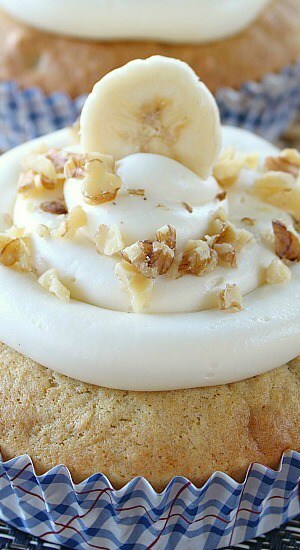 The buttercream frosting tastes amazing too! I should have called it cream cheese buttercream frosting but that just seemed tooooo long of a title. This frosting has both butter and cream cheese. Two delicious frosting ingredients in one tasty frosting. So good! When I was taking pictures, my sister in law came home from work and instantly started helping me. I needed someone to “taste test” one of these babies. She gladly agreed. I made some cupcakes as well which her input helped those pictures turn out awesome too! I’ll post the cupcakes later. Anyway, it was fun having her help me. Thank you Suzanne! How’s that sweet tooth doing? 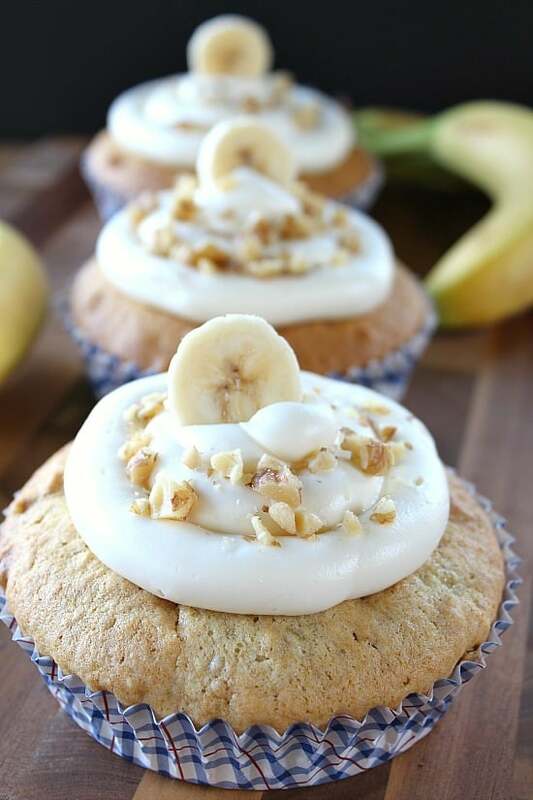 Are you a lover of banana desserts? Sweets? 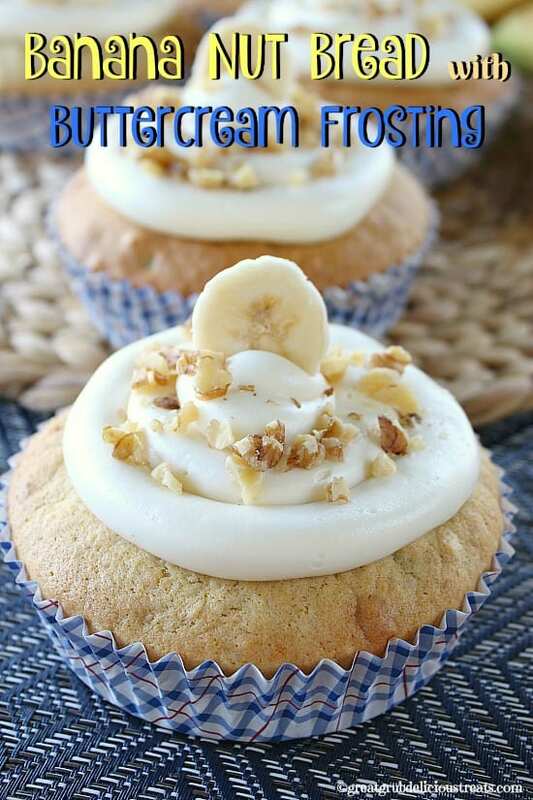 Then this is definitely a delicious banana dessert that you will want to make. 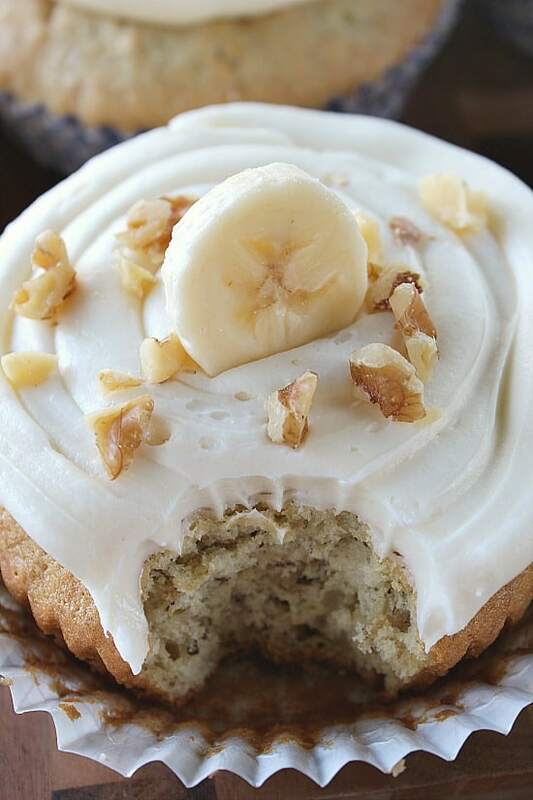 The frosting makes this banana bread so much better. 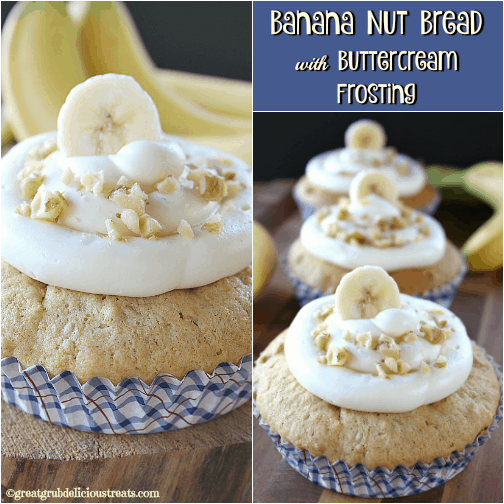 Buttercream frosting is a favorite of mine and added to this bread, top notch! Preheat oven to 350° and set oven safe baking liners on a cookie sheet. In a medium mixing bowl, beat sugar and butter together, then beat in eggs one at a time. Mix buttermilk, bananas and vanilla into sugar mixture and beat on medium speed until well incorporated. In another medium mixing bowl, whisk flour, baking soda, salt together. Stir dry ingredients into wet ingredients and mix well. Pour mixture 3/4 full into individual oven safe baking liners. Bake for 35-45 minutes or until tooth pick inserted in the center comes out clean. In a large mixing bowl, beat butter and cream cheese together. Slowly add powdered sugar and beat until creamy. Banana Bread recipe from Gold Medal® Flour. This recipe that was on a bag of flour we had purchase many years ago. If you do not have these baking liners, you can grease and flour (2) 8 x 4, or (1) 9 x 5 baking pans and bake for about an hour give or take. Here are a couple pics that are the perfect size for pinning to Pinterest. I wish I had one of those right now looks yummy!